Though the field of corporate governance has certainly transformed in recent times, it faces even greater challenges and further changes in the coming year. Against a backdrop of sluggish growth and uncertainty, dynamics within the boardroom continue to undergo an evolution of sorts, while pressure from all stakeholders grows apace. Significantly, investors – particularly the institutional kind, such as banks, insurance companies and hedge funds – will make a greater push this year for worldwide uniform corporate governance standards, while also increasing their expectations in terms of shareholder interests. In 2017, companies face continued political uncertainty in light of an unprecedented series of events during the previous year. Boards will therefore have to play a more active role in risk mitigation and planning as a means to reduce climbing costs and looming threats. Given this precarious landscape, it has also become increasingly important for companies to adopt a long-term strategy for value creation, which is reflected in the mounting pressure placed on boards to demonstrate such capabilities. The World Finance Corporate Governance Awards 2017 provide insight into these shifting expectations, while also celebrating the organisations that have made their boards more diverse and dynamic by placing long-term strategies in favour of short-term, results-driven plans. In managing such feats, the recipients of this year’s Corporate Governance Awards have not only made their companies more transparent and better positioned to handle risk, they are also drivers of excellent environmental, social and governance (ESG) policies in the world of corporate governance. Institutional investors, pension fund managers, public company directors and other governance professionals continued to push for the worldwide alignment of corporate governance throughout 2016. This trend is set to endure in 2017 in a bid to further promote corporate value creation in the long term. Regulators are responding to this ongoing trend with new reforms, particularly in emerging economies. As a means of modernisation, Brazil and India, for example, have borrowed the regulatory framework of advanced economies for their own corporate governance models. That said, although this is the case in some areas, there are numerous countries in which regulations have not caught up with investor expectations. In instances of regulatory insufficiencies, an increasing number of investors are choosing to communicate directly with boards in order to promote the reforms that they expect to see. Generally speaking, investors are now demanding more than ever. Consequently, it has become more likely that they will intervene when they feel regulations are not being met, or in the event that a board is not acting responsibly. Today, investors expect boards to take a more proactive approach in terms of forward-thinking management, particularly in the areas of scenario planning, strategy and executive succession planning. As such, long-term value creation is a major trend in corporate governance in 2017 and beyond, with companies subject to greater scrutiny as a result. Much of this push has to do with mounting uncertainty in the market and the growing trend of investor activists in the battle against short-term priorities that threaten long-term interests. Last year, the planet suffered two major political shocks: first was the UK referendum in June, which resulted in the narrow majority of the voting population choosing to leave the European Union after more than four decades of active participation. Then, in November, the successor of US President Barack Obama turned out to be not the politically experienced and well-versed candidate Hillary Clinton, but rather a political outsider with seemingly no tact, diplomacy or sense of decorum whatsoever. Elsewhere in the world, populist movements continue to emerge, growing not only in number but also in power, making them a force to be taken seriously. Such movements are adding to the level of uncertainty being felt globally, not only in terms of the political environment of their respective countries, but also the regulatory and legislative framework that they in turn support. For example, during his presidential campaign, Donald Trump hinted at his support for naming and shaming US companies that have benefited “unfairly” from moving jobs from the US. In preparation of this shift in American policy and the media scrutiny that may ensue, boards must prepare their companies to mitigate such events and any negative consequences that could arise. Likewise, the incumbent government in the UK has indicated it may support the ability of shareholders to influence executive salaries, as well as the public disclosure of CEO-employee salary ratios. Again, a company’s reputation could be at risk in such scenarios, requiring forward planning from its board. Now more than ever, investors want to feel certain that boards are taking a proactive, strategic approach in order to rejuvenate their companies in line with evolving expectations. They wish to see directors in place who have the skills and experience needed to help drive companies in forward-thinking directions, while also ensuring a variance in perspectives and backgrounds. According to the Harvard report: “Some investors see tenure and age limits as too blunt an instrument, preferring internal or external board evaluations to ensure that every director is contributing effectively.” Part of this process will involve external evaluations from third parties as a means of improving the feedback given to boards, which in turn will improve their governance. In Europe, diversity will be a particular theme that will keep arising in corporate governance, while executive pay will also remain a focus of both the government and the media. Likewise, ESG issues will play an increasingly important role in boardrooms in 2017, particularly those related to sustainability and climate change, as investors apply greater pressure in this regard. In conclusion, sustainability remains key. In ensuring sustainability, there will be greater expectations this year around the oversight role of boards, which will involve improved strategisation, scenario planning, investor engagement and executive succession planning. Again, this will entail continued efforts to refresh and optimise a board’s composition and skills that extend beyond mere box ticking. There will be greater scrutiny overall, from board composition to a company’s strategy for plans for sustained value creation. Namely, it is becoming imperative for boards to alleviate concerns about compromising a company’s long-term interests for short-term priorities. With much faster access to information, expectations among investors and the public are greater than ever before. For this reason, boards must continue working on long-term strategies, which include promoting greater diversity and transparency. This is particularly important given the possibility that the media spotlight may shine down on them at any point in time. While corporate boards may face more pressure in 2017, this could be the year when their transformation really takes off, for the better of both the companies themselves and the wider environment. 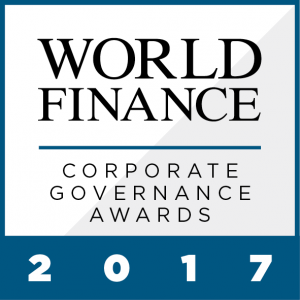 The winners of the World Finance Corporate Governance Awards 2017 are those firms that have shown time and time again that they are willing to face these challenges.